Google is weeks away from launching a job search that will give jobseekers unusual control over how to filter the results to best meet their needs. Google CEO Sundar Pichai announced the forthcoming Google for Jobs at its developer conference today in Silicon Valley. “46 percent of U.S. employers say they face talent shortages and have issues filling open job positions,” Pichai said. “While jobseekers may be looking for openings right next door — there’s a big disconnect here. The video begins at the point where Pichai describes the new Google for Jobs. The jobs search service pulls listings from across the Internet, providing access to millions of job postings. Searchers are presented first with matching jobs in their area. They can further refine the results by filtering in a number of ways including by job level, experience, title, full, or part-time, industry, and when the job was posted. A commute time filter will be added soon after launch, Pichai said. Companies that might be thought to be threatened by Google’s re-entry into job searching are partnering with the search giant. LinkedIn, Facebook, CareerBuilder, Monster, Glassd oor, and other career sites are sharing their listings. According to a report by USA Today which got a preview of the service, when a searcher clicks into the results, they are taken to wherever the listing was found, and can apply there. That clearly is an advantage to a job board, by exposing its listings to Google’s immense traffic. Pichai mentioned a one-click “Apply” button, but didn’t explain how it works. This isn’t the first time Google has ventured into jobs search. In the mid-2000s it launched a vertical search service called Google Base, that included classifieds, in addition to a dedicated jobs search. The program was quietly killed of some years later. 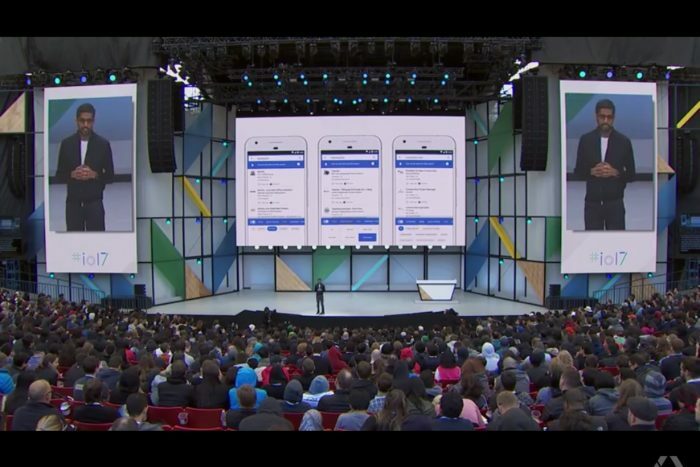 Now in addition to the new Google for Jobs, the company is also experimenting with an ATS-type of application for employers called Google Hire. Details are few; Google has released no specifics, but those who have seen the listings, suggest the product may be a commercialization of its self-built ATS. The Google for Jobs service will initially be rolled out in the U.S. with other countries coming later.